I am not sure why, but lately I have had the biggest hankering for some really good apple crisp. The thing is, I have never in my life been someone to whip up a pie. At all costs, I try to avoid hours in the kitchen and tedious food preparation. 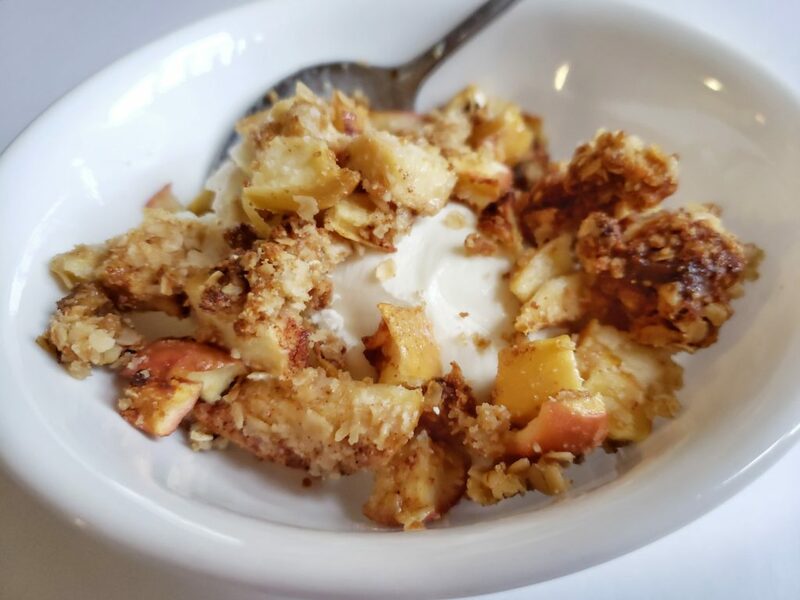 This is why when I finally whipped up this quick and easy, low calorie air fryer apple crisp that’s also gluten free, I was in heaven. 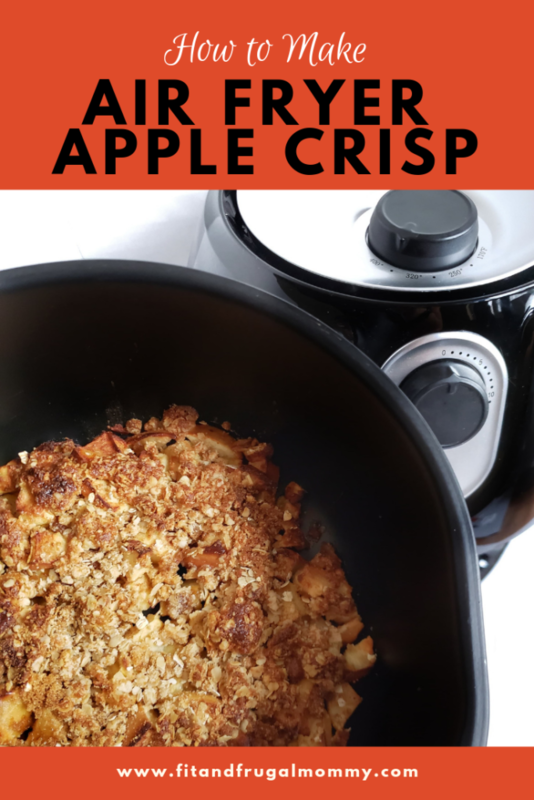 The first time I started experimenting with homemade air fryer apple crisp, I made it too sweet. As someone with a well known sugar addiction, that’s probably the most wild thing I have ever said. With a little experimenting, this recipe has the perfect amount of sweetness and crunch and my daughter asks for it every day. **Note: I don’t peel the apples because when they are cooked this way, the apples still have a slight crunch to them and I don’t find the peel noticeable. If you have the time – or an aversion to apple peels – feel free to peel them, though it is not necessary. In a bowl, mix the chopped apples, lemon juice, cinnamon, maple syrup and 1 tablespoon of the almond flour together. Mix until apples appear well coated. Place the mixture in the air fryer baking dish, as shown above. In another bowl, mix together the quick oats, brown sugar and remaining almond flour (2 tablespoons). Mix until well combined. Heat the light butter in the microwave in a microwavable dish until melted. Mix the butter into the topping bowl until most of the dry ingredients are well mixed. Not all of the topping will be wet. That’s okay. 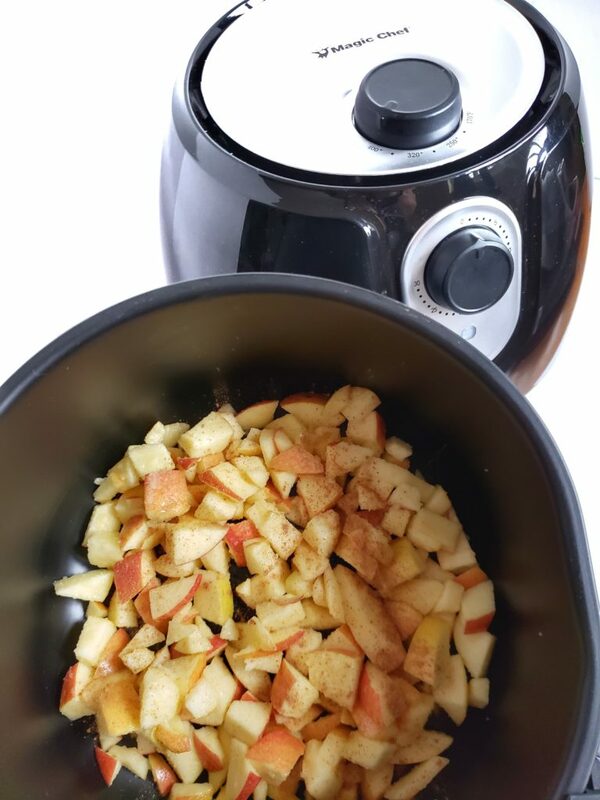 Spread the topping over the apples in the air fryer baking dish, shown above. Place the dish into your air fryer and cook for 20 minutes at 350 degrees Fahrenheit. This cooks the apples to be slightly tender and leaves a deliciously crunchy topping. That’s it! Your deliciously low calorie, heart warming apple crisp is ready. I serve this over 97% Fat Free Vanilla frozen yogurt in my house or on top of greek yogurt the next day (if any survives). 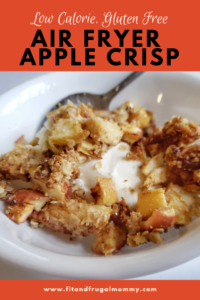 Vanilla ice cream would also pair with this apple crisp nicely. Have a favourite dessert you’ve been craving lately? Let me know in the comments below! 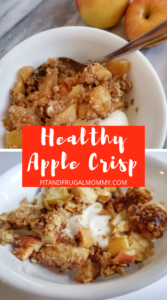 A satisfying apple crisp with a delicious crunch that’s super easy to make. Gluten free and low calorie! In a bowl, mix together the chopped apples, lemon juice, 1 tbsp of the almond flour, maple syrup and cinnamon. Stir until well coated. 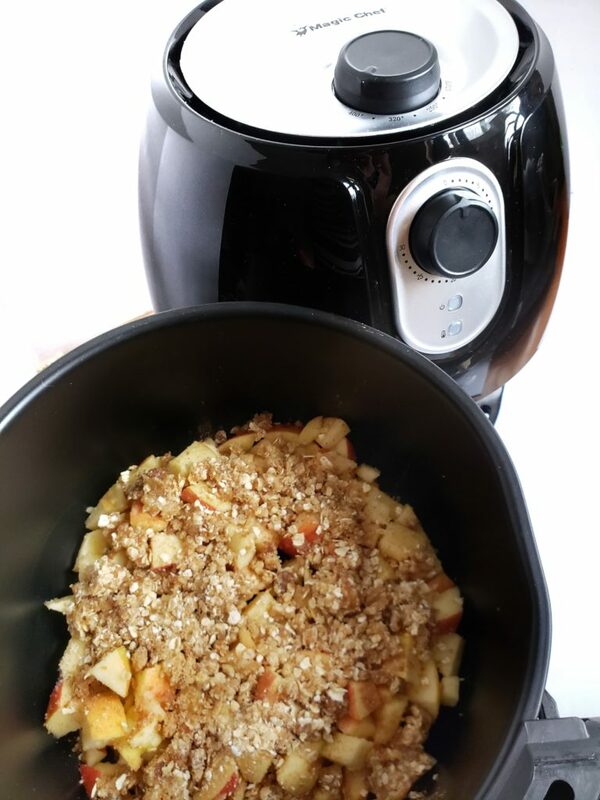 In the baking dish of your air fryer, layer the bottom with the apple mixture. In a separate bowl, mix together the brown sugar, oats and remaining almond flour. Once these ingredients have been mixed well, mix in the melted butter trying to coat as much of the mixture as possible. 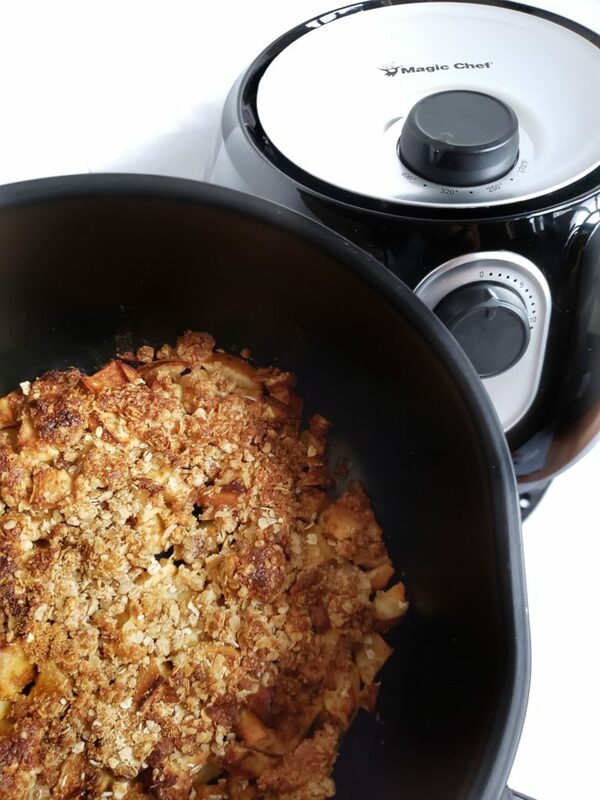 Cover the apple layer with the brown sugar topping mix in the air fryer baking dish. Turn the air fryer to 350 degrees Fahrenheit for 20 minutes. Allow time to cool slightly before serving. Optionally serve on vanilla ice cream or frozen yogurt. 6 WW Freestyle points | 192 Calories, Carbs 34.5g, Fat 6.1g, Protein 2.5g, per serving.